We are pleased to present to you the 2018 Member Benefits & Opportunities Guide. This booklet serves as a resource for all of your membership and sponsorship needs. We secure our events and programs one year in advance, and we hope that you will take a few minutes to take a look and place these events on your schedule. Some of our members are looking for increased brand recognition, business publicity or to simply support the activities of the Chamber. We would love to work with you in partnering with us to sponsor an event or program. 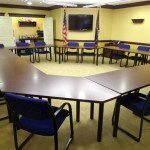 Central PA Chamber members may reserve the Board Room, free of charge, on a first come first serve basis. The Board Room may be used 24/7 for meeting and training purposes. Refreshments and meals may be brought in and we encourage our members to utilize other member’s services. Central PA Chamber members or businesses who build a new facility are encouraged to hold a groundbreaking ceremony (at no cost to the member) prior to construction. Members who wish to host a ceremony must simply contact Chamber staff to schedule a time and date. 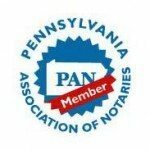 Offering customized innovative benefit programs for businesses of every size, Pennsylvania Chamber Insurance provides a complete spectrum of coverage solutions for Chamber members. Multiple medical plans from nearly every major carrier in the state and a complete line of optional specialty coverages provide the choice of programs best for employees. We can get a free no obligation quote for anyone at anytime. The Chamber’s web site is a great resource for people seeking information about the Central Pennsylvania Region and draws more than 4,000 new visitors per month. Members receive a free alphabetical and unlimited categorical listings and a free direct link to your own web site. We make this connection immediately once you become a member. Chamber members are encouraged to offer exclusive discounts or special promotions to other Chamber members to promote your business and to strengthen membership unity. There is no fee for members to participate in this program. For more info, click here. The Annual Awards Banquet is the Chamber’s largest membership event of the year. It recognizes the incoming and outgoing Chamber Officers and Directors and celebrates the accomplishments and milestones of our members. The banquet includes a sit down meal and the frequently talked about dessert buffet. The Chamber offers a morning networking breakfast 6 times a year for Chamber members and their employees and for prospective new members. Refresh your knowledge of Chamber activities and benefits or come and meet our new members. Attendees have the opportunity to give a 28-second commercial about their company. The sessions are held from 7:30 am to 9:00 am at the Chamber office and are free to attend. Each Breakfast Briefing will begin with a breakfast buffet at 7:30 am followed by a presentation at 8:00 am. The program will end promptly at 9:00 am. This event is limited to 30 people and registration is required. More than 100 golfers participate in this relaxing, fun-filled event at a member golf course to show their support for the Chamber’s Business and Education programs. Lunch, goodie bags, contests are included in this special event that raises money for the work of the Chambers Business & Education Association. Legislative Breakfasts provide an opportunity for Chamber members to meet our federal, state and county-elected officials and to hear about issues affecting the community and specifically the business climate. These events draw area business leaders as well as local municipal officials. Make professional contacts in an informal setting at an Open House. Hosted by members for members and guests, this is a great way to promote your business and develop long-term relationships while having fun. Our Chamber maintains the “small town” warmth and hospitality that makes our membership friendly and approachable. host one of these events at your business and we’ll take care of all the promotions. Our Chamber members receive free notary services & legal certification on exported goods at our Office located at 30 Lawton Lane in Milton. Appointments for this service are suggested. Members are encouraged to display, free of charge, promotional materials such as business cards, brochures and announcements at the Chamber as the office is regularly visited by information seekers. This profile information is taken from the Center for Workforce Development & Analysis and includes information pertaining to the Central Pennsylvania Region. There is no fee for Chamber members. 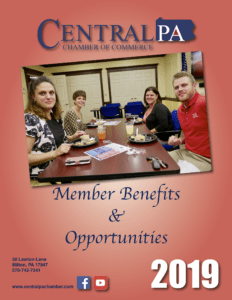 There is no fee for Chamber members. Members are entitled to free business listing in this professional business directory released annually in the spring. There is no fee for Chamber members. This list contains contact information of all current Chamber members. The Chamber is often the first place that tourists and new arrivals inquire about a map of Central Pennsylvania. Display advertising is available on the map. More than 10,000 free maps are distributed annually, make sure you have some for your office or business. Information on available sites, commercial and industrial buildings is gathered from our Members and updated monthly. Click here for Available Properties. The Chamber receives hundreds of calls every year from people seeking local products and services. Membership puts your business on the tip of our tongues. We only refer Chamber members. The Chamber works with local government officials in the region to make doing business in the Greater Susquehanna Valley the best it can possibly be. The Chamber studies state and federal issues, takes positions that encourage economic well being in the Valley and effectively communicates the voice of the business owners to appropriate elected officials and government offices. For no fee at all, the Chamber’s staff will help coordinate your ribbon-cutting to showcase your business. Whether you are a new member or have been one for a long time, we would be happy to help publicize your important event. 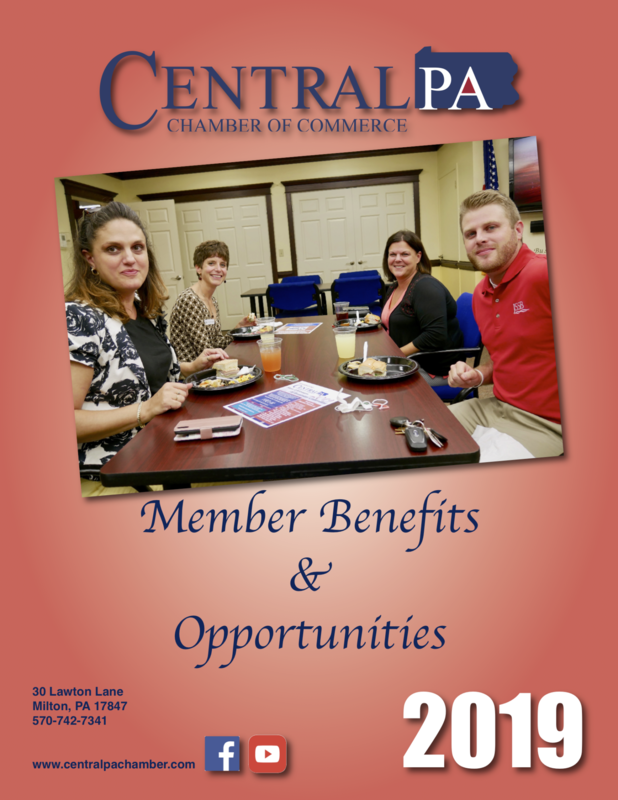 The Central PA Chamber of Commerce offers a wide range of exciting events throughout the year. All members are encouraged to attend events and to become an event supporter. 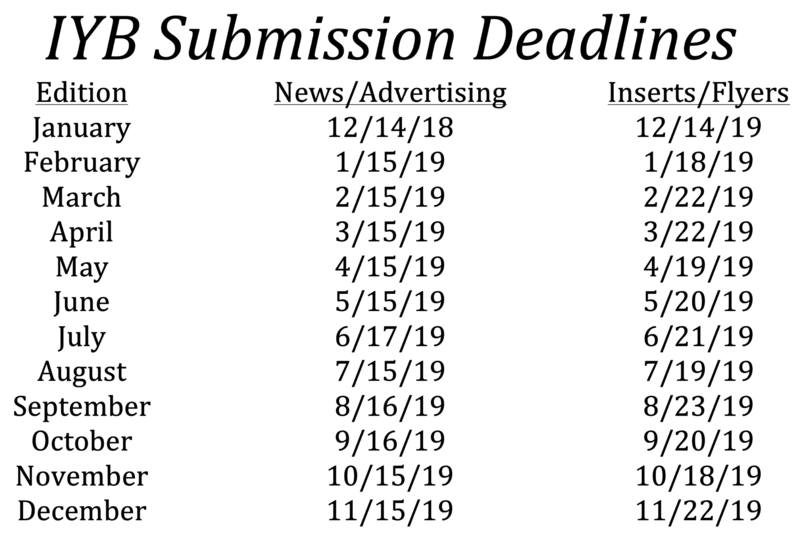 Sponsorship opportunities are offered year round and can fit budgets of all sizes. Gain positive exposure by selecting from the many sponsorship opportunities available. Studies show that businesses are viewed by the public as having good business practices, being reputable, caring about their customers and having a positive impact on the community when they are active in their local Chamber of Commerce. Chamber members can advertise or insert flyers in this publication by contacting Jeff Shaffer at 570-742-7341 or e-mail [email protected].